The panel members of the Fast Money Half-Time are absolutely giddy today as they obviously view today’s break higher in the market as a clear sign that we are headed to new all-time highs. Are we? Maybe … let’s look at the charts. When you actually look at the price structure of the move higher, you can still see that we are possibly making/completing a 3-wave corrective bounce right into the median line of the broadening price pattern that I have been tracking/following. 3-wave patterns are typically shows of strength and not typical of corrective price action – one could argue the extreme oversold position of the market at Christmas has led to a stronger than normal corrective bounce, but that it is still a bounce nonetheless. That could be possible, but as a trader, when price pulls back from this original move out of the Dec lows, I have to be on guard for minor support to hold and another attempt to move higher. That is still to come however. The bullish scenario that leads to a retest of the all-time highs would be best if price were to pull back into minor support after completing this initial 3-wave bounce. Price then could make another push higher. However, based on my current read of price structure, I am still holding out as my favored scenario, one where we head back down and make a new marginal low below the Dec 2018 low. That would likely be the end of bigger wave-2, and lead to a more meaningful bounce into resistance that would likely last about a month. Is it even possible that we are at resistance here and about to head lower? I think so … we are at the median line in the broadening price pattern; we are in the 1.272x – 1.618x extension price target zone drawn using Wave 1; we are right at the upper limits of the SLOT resistance zone (just a touch over with today’s break higher); and finally, we have pushed into the minor 1.272x-1.618x extension target zone for the last minor wave 3 of the corrective bounce. The final test would be whether or not we can see a smaller 3-wave structure inside wave 3 of the corrective bounce so that we can call a possible end to the bounce with today’s price action. I can count 3 minor waves on the final move into resistance here so yeah …. it is possible that we are making the final move of the corrective bounce higher here today. Bottom Line … when you try to determine price structure of smaller time frames, it is often a very tricky en devour. Key to not losing your way is to be patient and be on guard for something other than what you are expecting to possibly occur. That is why I always look at both sides of a possible trade structure. The last week in the market has been a real head scratcher. From a news standpoint, I’ve seen zero positive information. Brexit fails, Gov’t Shutdown ongoing, China/US Tariff War, Global Recession indicators ticking up. The only thing that makes sense it that this is all vol related where trusts and family offices roll covered calls and are options selling, which is just like a typical January. If that’s the case, I think your model still applies, but it’s getting delayed a bit. Maybe an additional minor 3-wave structure higher has been added? Is that possible? I’ve been going back and reading your older posts, but haven’t read anything that actually supports that theory of a minor wave structure being added. Do you think a reversal is dependent on a negative catalyst at this point? I dont even know what that might be because the market seems to have been ignoring ongoing bad news anyway (perhaps impeachment proceedings in the house). Otherwise what are we looking at as the next resistance as of now? Thanks! Hi Kevin, thanks for the great blog. 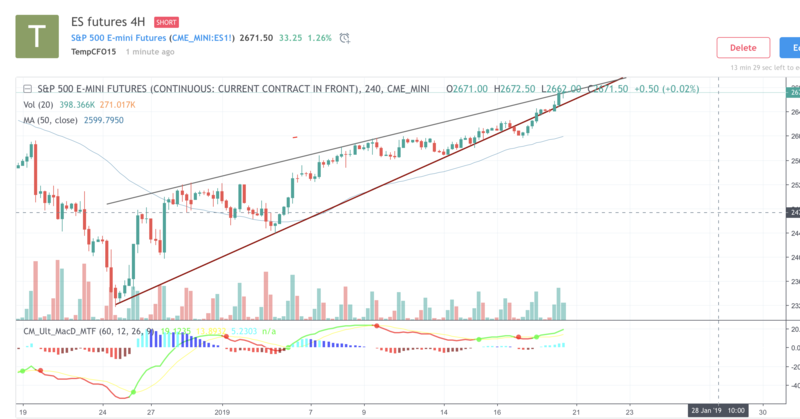 I have been following futures and the charts show a rising wedge for /ES. What is your opinion about this wedge? I was expecting a correction soon. Thanks.